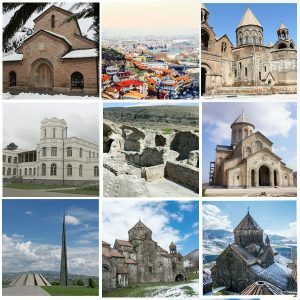 You will often hear Armenians speak of Garni-Geghard as if these two monuments were one landmark, but this is only due to the fact that Garni and Geghard are neighbors. In reality, they couldn’t be more different. 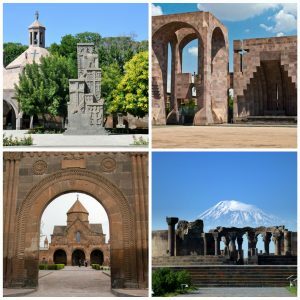 Garni – a pagan palatial complex and Geghard – a medieval Christian monastery are the most treasured and visited sites in Armenia. 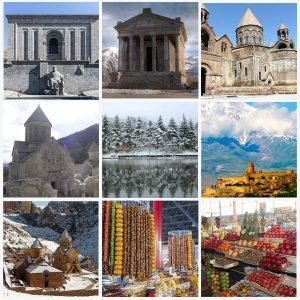 Throughout history, Geghard Monastery has had many names: Ayrivank (Monastery of the Cave), Monastery of Seven Churches and Monastery of Forty Altars. It was famous because it housed relics of apostles Andrew and John, and the most celebrated relic – the spear that wounded Jesus Christ, allegedly brought there by Apostle Thaddeus;this is how the present name of the monastery originated – Geghardavank – Monastery of the Spear.Today,part of the Spear resides at the Treasure House Museum in Etchmiadzin. 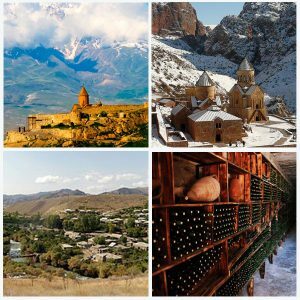 Because of the profound influence it had on Armenian monastic architecture, Geghard is listed as a UNESCO World Heritage Site along with the spectacular towering cliffs and Azat River gorge surrounding the monastery. Grikor the Illuminator founded the complex in 4th century at the site of a sacred spring. To this day people travel here to drink the holy water. In 9th century the monastery was destroyed by Arabs, but was flourishing once again by 13th century under the patronage of Proshyan princes, who are buried here. 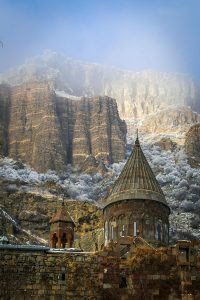 Except for the main Katoghike Chapel, built in 1215, Geghard complex is rock-cut, meaning it’s hewn out of a solid mountain. 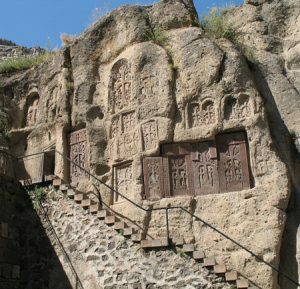 Inside, its rooms are dark, somber and cool.Surrounding the church you will find ancient caves, where monks used to pray and a plethora of singularly beautiful khatchkars (stone-crosses) that are placed among the rocks or embedded into the walls of the mountain and the church. One of the most famous spots here is the Upper Gavit (Vestry), accessible through a short rock-cut corridor, which leads to a bell-shaped room with four thick columns covered inspiritual writings, crosses and other symbols. 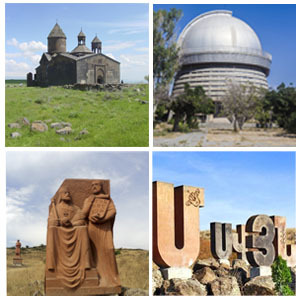 For centuries the phenomenal acoustics of Upper Gavit have amazed every visitor. When here–try experimenting: close your eyes and listen how every sound reverberates off of Gavit’s giant bell walls, beautifully distorts and comes back to you in a different shade. This exercise will make you feel blissful and content. No matter what your religious views are, Geghard will not fail to astonish you with its divine, spiritual atmosphere that dominates here.